If anybody talks about the properly historic hotels of Cairo, then invariably it’s Shepheard’s that gets mentioned. 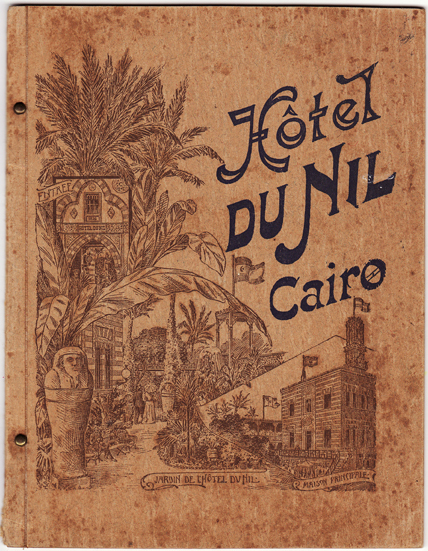 Rightly so – until it was destroyed in 1952 it had renown and a guestbook to rank with any hotel in the world. 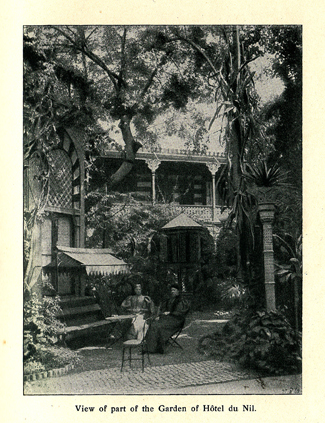 But there were hotels in Cairo before Shepheard’s, including the Orient, Giardano, Levick’s and the British Hotel, formerly Hill’s, which is where Samuel Shepheard got his start in the trade before he opened an establishment under his own name in 1851. 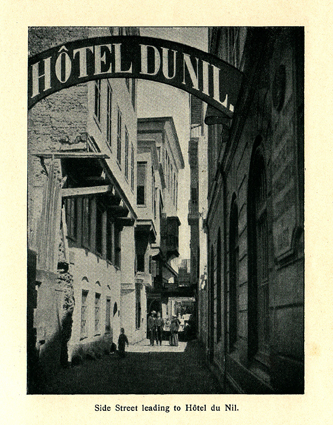 Chief among the early hostelries, though, was the Hotel du Nil. The du Nil was established in 1836 by the half-German, half-Italian Signor Friedmann. Like all the early hotels that came before Shepheard’s, it was buried in the alleyways of the medieval city, just off the Muski, one of the busiest commercial streets in Cairo at that time. It was a traditional and sizeable Arab house with striped stonework and mashrabiya, set around a large courtyard filled with palms, and banana and orange trees. Famously, it’s where Gustave Flaubert and companion Maxime du Camp stayed in late 1849 at the start of their voyage around Egypt. Du Camp photographed Flaubert wearing native dress in the garden. At a later stage management added covered terraces and a large veranda, as well as a curious rooftop tower of scaffolding, known as the “belvedere of Cairo,” which provided guests with views over the city. From up here the then-owner, Cavaliere Battigelli, conducted observations that he published as a daily meteorological bulletin. Not all Englishmen were as sniffy about the place. 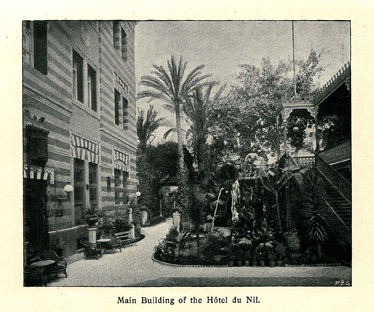 Egyptologist Flinders Petrie was recommended the hotel when he first arrived in Egypt in 1880; for the next 11 years he stayed there whenever he was in Cairo. 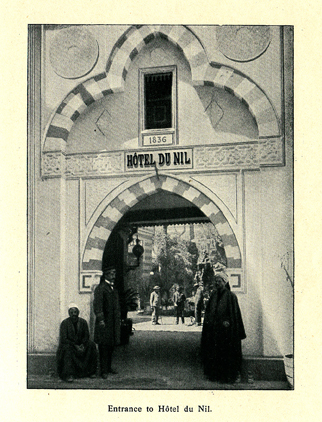 The Hotel du Nil survived into the first decade of the 20th century but its facilities must have been hopelessly outdated, especially when measured against the offerings of the glut of new hotels that were appearing around this time. The exact date of closure isn’t known, According to 11th edition of Murray’s Handbook, published in 1910, the hotel closed in 1906, although the garden and the tower were still accessible (thank you Susan J. Allen for this bit of information). 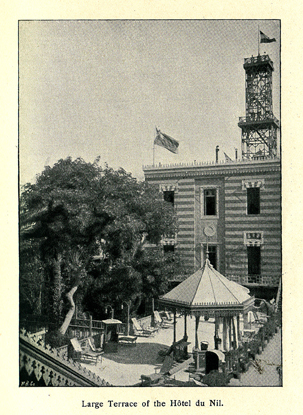 Soon after, the Bristol Hotel on Khazinder Square, which had opened in 1894, was marketing itself as the Hotel Bristol et du Nil – it was common practice in Cairo at this time for a new hotel to absorb the name of a recently defunct old hotel in order to inherit its clientele. It stood on the western edge of the Khalig al-Masri (the canal that once ran off the Nile north through the city) and just to the south of the Muski (coloured red on the map). 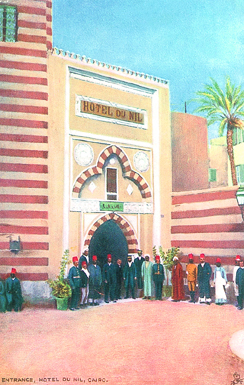 The main approach to the hotel was originally from the Muski, but when the canal was filled in to become Port Said Street (orange) in 1900, that then became the main route to the hotel, as described in an article in the Egyptian Gazette of that year. 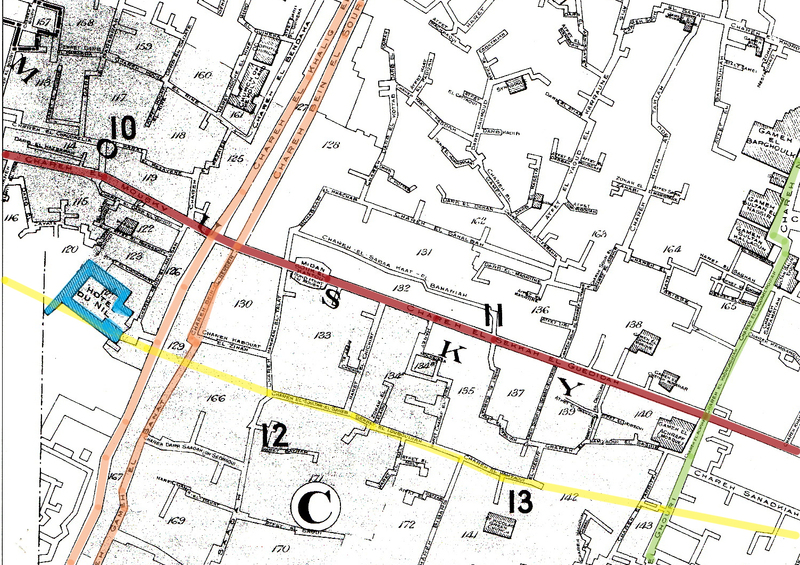 The line in yellow on the map shows roughly the route of what is now Al-Azhar Street, which crashes through the site of the du Nil. However, Al-Azhar Street was only created in the 1920s and the du Nil disappeared long before then. The likelihood is that it was lost to a widening of Port Said Street, which since its creation had become one of the city’s busiest tram routes. Nick Warner’s map then must be one of the last recordings of the existence of the hotel.